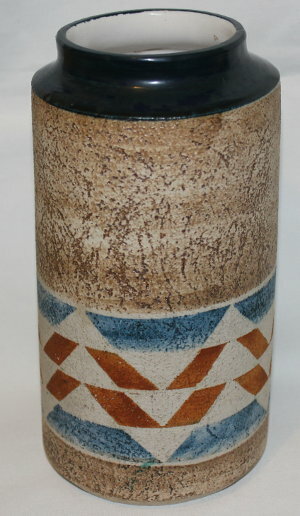 Troika Pottery Shouldered Cylinder vase decorated by Simone Kilburn. Simone Kilburn only worked at the Troika Pottery for a couple of years when it was based in Newlyn, Cornwall, England. She worked there from c1975-1977. This Troika Cylinder stands approximately 19½cm tall and is 10cm in diameter. 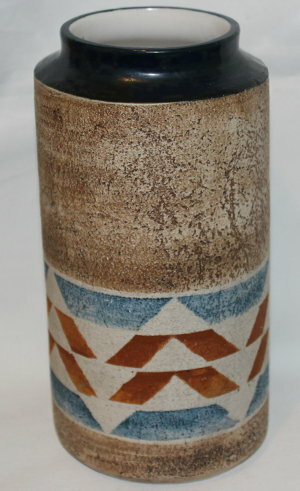 It has been decorated with a brown base with striking abstract diagonal lines around the body of the vase. It is finished with a deep blue glazed shouldered top. On the base of this Troika vase is the black painted Troika Pottery mark, Troika England, along with the Troika decorator mark of Simone Kilburn. This is a genuine Troika Pottery vase dating to the mid 1970's. Condition: Excellent overall condition. A lovely large vibrant Troika vase.